We’ve had a couple days of snow. And more falling. Maggie and I were, as always, on the Eastern Prom this morning, post-holing our way along (why did I give away my snowshoes?) and I heard the call of the fog horn from the bay. The sound rolled in from the South. I thought perhaps it was Bug Light but I’m given to understand that is only an optical warning. Regardless, it was haunting. The water, the fog, snow, and the warning call. I find it refreshing that a technology hundreds of years old is still used in the age of satellite navigation and GPS. I stood in the snow and listened quietly. It seemed more a beckoning call than a warning, I confess. 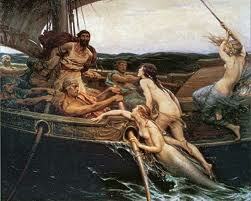 Famously, Odysseus was curious as to the call of the Sirens. He had his sailors plug their ears with beeswax and tie him to the mast. He wisely ordered his men to leave him tied to the mast, no matter how much he begged. And beg he did. But that isn’t the fatalism I’m suggesting. This wasn’t a siren’s death call. It seemed more a beckoning than a warning, which is literally what it is–a warning. (History is filled with such confusion. Philosophy is doubt, said Montaigne.) But that’s not where I’m heading. Two things. Small things. Old technology can still work. Perhaps in the long run we will discover it worked best. Who knows? Secondly, more importantly, stand in the snow, stop and listen. You might hear a call beckoning. Or perhaps a warning. Either way, you will miss it with your ear buds in. Thanks for checking it out. Old blog, new face, new effort.